Ruby contributor! Proposed and wrote the initial implementation of String#casecmp? Contributed production code (and tests) daily via Ruby on Rails, RSpec, Postgres, Redis, Git, Github and various third-party APIs. Improved collective code quality by participating in code reviews on all Github pull requests. Reduced similar-record database insertion times by 95% (over standard ActiveRecord) by implementing a bulk-record insertion feature. Customer/company POC for all procurement, production, and sell-off activities for multiple Engineering Development Model deliveries (approx. $43M in revenue). Utilized Earned Value Management to analyze cost & schedule performance, to forecast program performance, manage risk & opportunity, and plan & maintain an Integrated Master Schedule. Eight consecutive annual performance rankings in the top quartile of labor grade. Oversaw the planning, execution, and reporting of $50M in revenue and multiple hardware deliverables. Completed multiple successful internal and customer audits, and quarterly compliance reviews. Assigned a “High Potential” designation by performing in the top 2% of salary grade. Why it’s cool: I like this project because it’s an interesting mix of hardware and software. The Raspberry Pi is fully capable of supporting Debian linux and running a rails server, while this project relies upon an analog moisture sensor, an ten-bit A2D converter, and a power relay to switch on the aquarium pump. Description: A Ruby gem that creates a simple DSL for creating a Raspberry Pi web server to monitor sensors, switches, and buttons via the Pi’s GPIO pins. Utilizes a simple, mobile-ready interface, and supports dns-sd/Bonjour discovery of other whipped-cream Pis on the local network. 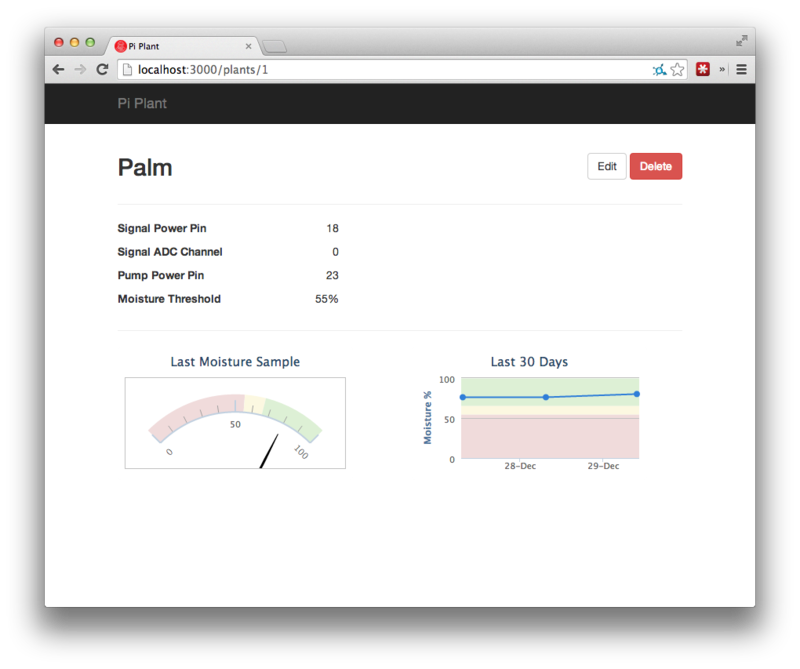 Why it’s cool: Anything on the Pi is fun, but this project was also my first significant open-source contribution. It was also my first foray into ruby gems, and let me learn a bit about Travis CI and dns-sd. 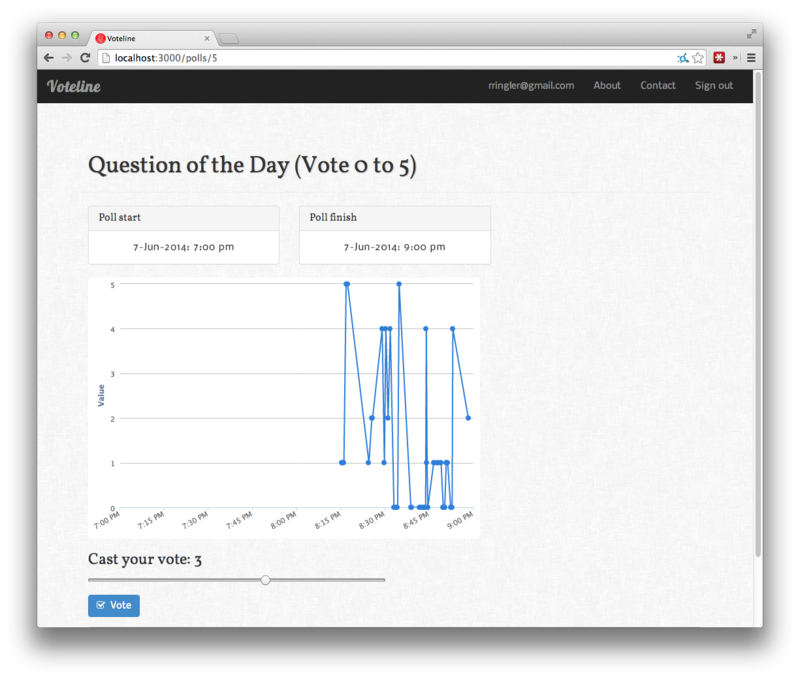 Description: Your typical public-facing rails prototype that implements real-time public voting (similar to real-time polling during political speeches.) 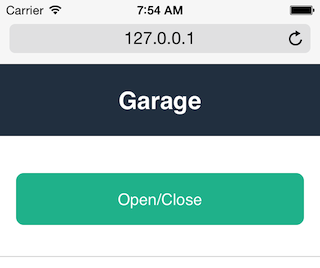 Uses bootstrap for layout, devise for user authentication, and Highcharts for data plotting. Description: A small weekend project to learn a bit about Sinatra/Padrino. 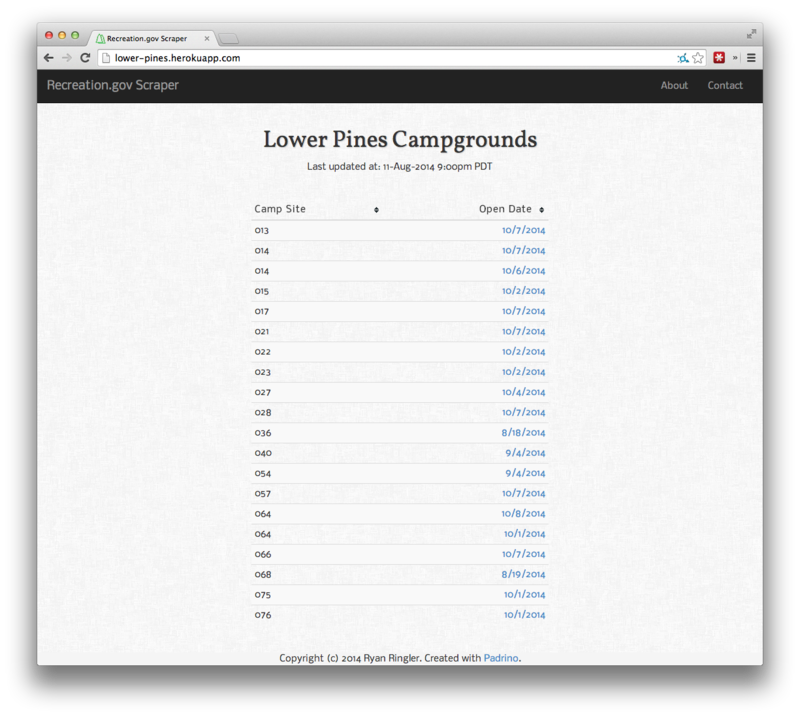 This site scrapes the recreation.gov website for open dates in Yosemite’s Lower Pines campground. Utilizes the Padrino framework, ActiveRecord for data persistance, and bootstrap for appearance. Why it’s cool: This project was fun because it introduced me to an alternate MVC framework, and helped me realize what parts of rails really shine and what parts I could live without. It’s also super convenient.